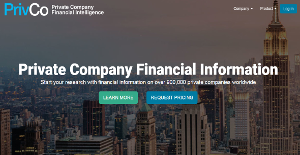 While most business intelligence platforms provide you with tons of data on public companies, PrivCo delivers you the latest news and updates as well as financial data on private enterprises. Financial information on privately held firms is quite elusive and hard to find, and PrivCo attempts to be a game changer by providing reports ob over 31,000 private companies and 8500 private investors (including venture capitalists). PrivCO caters to a variety of audiences, with the list composing of market researchers and business students who are studying private firms, large corporations looking out for rising competitors, and start-ups and expanding enterprises in need of investors. PrivCO sources its information from a number of reliable sources (new reports, regulatory filings, and industry sources among others). It then uses special algorithms to aggregate and refine data and then reviewed by their clients so they can make better business decisions. PrivCO offers typical company profiles on private firms, with each profile containing basic details such as summary and history of the enterprise, owner/s name and their stake percentage and financial details such as revenue, mergers, acquisitions, etc. Financial information are shown in tables and graphs, making them easy to read and understand. Users will definitely love how PrivCo makes it easy for them to find more information about a company’s merger, acquisition, or funding round. There is a link provided for each merger, allowing users to quickly access additional details. The Knowledge Bank feature functions as an online encyclopedia that users can access to know more about stages of the private-company life cycle (from seed capital to late stage investment and beyond) or learn about the history of venture capital. The advanced search functionality enables users to look for specific information. They can filter their search based on location, companies, mergers, and more. Also, they can drill down their venture capital funding search and the private equity search based on industry, amount of investment, and specific location. But on top of the premium features and capabilities, PrivCo’s main highlight is its neat and simple design and intuitive build that makes it easy to navigate. Getting the information you need in one transaction is also a breeze. If you are interested in PrivCo it may also be a good idea to analyze other subcategories of Best Business Intelligence Software collected in our database of SaaS software reviews. Since each organization has particular business requirements, it is sensible for them to refrain from looking for a one-size-fits-all faultless software system. Needless to say, it would be futile to try to find such a platform even among market-leading software platforms. The smart thing to do would be to list the various important aspects that need consideration such as key features, finances, skill levels of staff members, company size etc. Then, you should do your groundwork thoroughly. Read some PrivCo reviews and look into each of the other apps in your shortlist in detail. Such exhaustive research can make sure you discard ill-fitting platforms and zero in on the system that presents all the aspects you require for business success. How Much Does PrivCo Cost? We realize that when you make a decision to buy Business Intelligence Software it’s important not only to see how experts evaluate it in their reviews, but also to find out if the real people and companies that buy it are actually satisfied with the product. That’s why we’ve created our behavior-based Customer Satisfaction Algorithm™ that gathers customer reviews, comments and PrivCo reviews across a wide range of social media sites. The data is then presented in an easy to digest form showing how many people had positive and negative experience with PrivCo. With that information at hand you should be equipped to make an informed buying decision that you won’t regret. What are PrivCo pricing details? What integrations are available for PrivCo? If you need more information about PrivCo or you simply have a question let us know what you need and we’ll forward your request directly to the vendor.